Maureen MacNamara, PhD, MSW, Appalachian State University, Boone, NC. Maureen is assistant professor of macro-practice social work, consultant in human-animal relationships and animal-assisted interventions (AAI), whose work focuses on inter-professional relationships in organizational learning and change strategies, factors influencing development and implementation of AAIs, and development of functional animal screening procedures. Maureen is past Vice President of Programs for Delta Society (Pet Partners) and created the Pet Partners program. 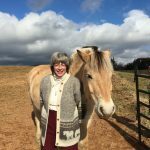 She is an avid equestrian and shares her home with any number and variety of creatures.